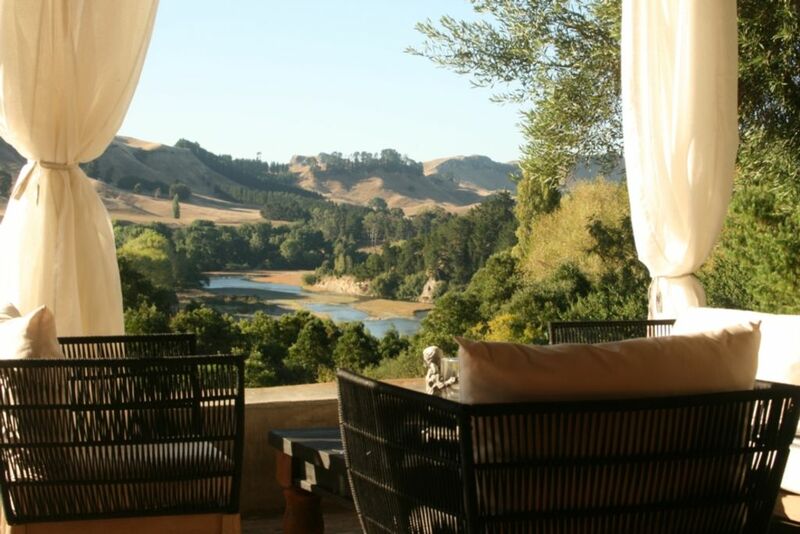 We are on the sunny side of the Tukituki river, overlooking the most picture perfect part of the valley with views downstream to Horse shoe bend and upstream to Mt Erin. It's a peaceful and private location with mature trees and places to explore on the 24 ha (60 acres) property. We have fruit trees including figs, olives, apricots, plums, oranges, lemons, grapefruit, mandarins, passion fruit etc that guests are welcome to pick from when in season. This is a family farm house ideally suited for outdoor living and entertainment in the summer under the ancient olive on the patio or the expansive deck alongside. In winter, the house comes into its own with the half-metre thick lime washed walls providing unbelievable insulation. At this time of the year the inside of the house comes alive with atmosphere. There's no better place than in front of the huge open fire place to curl up with a book, break open a pack of cards or watch a movie on Netflix or Lightbox. All the house is available for use. This is a well-loved, lived in, rustic family home. It's designed for country living so while we expect guests to treat it with respect, we don't expect guests to tip-toe around frightened they might leave scuff mark on the timber floors or lime washed walls. It's a house to enjoy not be prissy about. There's no better place for a group of friends or families to get-away or for a special romantic hideaway for couples. Our house overlooks a 500 metre stretch of the Tuki tuki river that we own. Guests are welcome to use this for picnicking, swimming, fishing, walking, camping or just to pitch up for an evening drink beneath the willows on the riverbank. It's not just a stunning place for adults, it's paradise for children. Advice on fishing guides and clay target shooting from the front deck can be arranged and we can offer tips on where to go and what to do in the fabulous Hawkes Bay. Cleaning can be arranged and minimum stay nights increase on pubic holidays. Great Views, Style, Great Host and...cockroaches? 2 Stars. We are a family of 6 with 4 kids aged 2-10. Booked 39 nights but only stayed 15. Other travellers be aware. Please check the strict cancellation policy here. These concerns are solely with the property and not the owner. We woke up daily to dead cockroaches on the master bedroom floor and in other rooms and hallways that we had to clean up. Occasionally live ones would run up the curtains, or once, even across my wife on the couch. Some sort of worm/larvae on the master bed pillows 2X and in daughters room 1X. By the end of the two weeks we were jumping at everything, struggling to sleep and left really ready for a break from the property. We didn't want to cause any problems or maybe even admit we were struggling. We were committing 6 weeks of our time in NZ here. We had a 10 day gap for other renters (previously booked) to come in and this served as an opportunity to reflect and ask ourselves "do we really want to live out the rest of our holiday in these conditions?" The answer was a clear no. We had to make the right choice for our family. We reluctantly raised our concerns 2 weeks before returning. The owner informed us that during cleaning, there was no more insects including cockroaches left after our stay than for any other renter. “The reason we have a high rating with guests and no comments about this issue is because the vast majority of people understand and respect we are trying to kill as fewer insects as possible.” So if this is you, you’ll love it here as many have. But if you just can’t do cockroaches, please be aware you will contact them here. We believe this is an element of this country style property that should be fairly and justly communicated to any potential renter BEFORE arrival. Not left for an - oh by the way… once you arrive. For the premium price, we have experienced MANY other places that do not have this issue all over NZ. At the time of writing, We have no guarantee of a refund. This family have posted a grossly misleading and inaccurate review. I say this because our opinion is they made a scurrilous complaint to try and wriggle out of paying for a confirmed five week booking one day before pay-up day. The complaint - that there are insects at our home and cockroaches are a problem – was not upheld by this booking site and they lost their 50 per cent deposit. Isn’t it strange how hundreds of guests we’ve had stay, including immediately before and after these people, have never posted a review like this? They stayed 15 nights at our home in the country where it’s hardly a secret you come across insects. As with all guests, one of the things we told them when showing them around, is that cockroaches live throughout New Zealand. But because our home is professionally treated twice a year inside and out, at most they might see an occasional dead or dying roach just like you might in any other house in New Zealand. They did not make a single complaint in 27 texts sent during their stay or in several conversations nor when I took them for a free quad bike ride round the farm. They did not complain when asked three times in writing if they had any questions about their stay. As planned they then went to Australia for 11 days having already paid the deposit for a second stay with us – a 34 night confirmed booking. The day before they were required to pay the balance, they emailed asking to cut short the stay to 10 nights and pay no more money. I have one question for them: Why did you want to take your children back to our home for 10 nights and pay no more money if your concerns about staying there were genuine and real? They refused to pay what was owing and instead concocted a complaint to try and get their deposit back. The complaint was closed by the booking site who released their deposit to us. We have a total of 67 reviews of our home on three booking sites overwhelmingly receiving five star ratings. Not a single mention of any insect. Hardly surprising. Readers can judge for themselves but we think this was a try-on to avoid paying what was owed and to try to retrieve their deposit. Communication was civil but after the dishonourable, deceptive and damaging way they behaved we can’t recommend them. Stunning views, peaceful location, spacious accommodation and a relaxed, generous and attentive host / landlord made our four night stay highly enjoyable and memorable. The house is fascinating in both its construction and contents and is filled with history, warmth and curios. The polar opposite of a stark rental house. Plenty of room with four decent sized bedrooms [one king, two doubles and one twin] and a huge outdoor / indoor lounge / kitchen / entertaining area. Wood fires, decent insulation, did I mention the views........amazing!!! The only slight negative point is in the bathrooms - a total of two toilets, one working shower and a bath for such a large place meant bathroom activities had to be carefully rostered but it's not a deal breaker and we would very much like to return soon. What a beautiful home in a stunning location, we enjoyed our stay so much and we’ll definitely be back! This house is incredible, Nicky’s styling is on point and those views! This house is incredible, Nicky’s styling is on point and those views! We didn’t want to leave and will most definitely be back! Lovely characterful house in a beautiful, quiet, relaxing location. Lovely characterful house in a beautiful, quiet, relaxing location. No-one who stays here can possibly be disappointed.